The striped body painting of character 25 on the East wall is also an allusion to the morning star or Tlaawiskalpaneekwtli in accordance with the Venusian tables known from the codices (pic 1). As was pointed out by Eduard Seler (1963), an iconographical trait linked to the heliacal rising of Venus is that his wounded victims were naked. 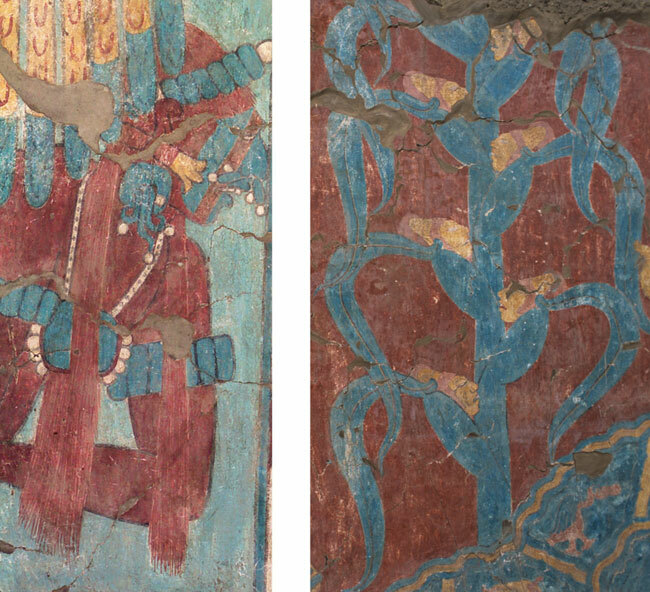 A revealing detail in the image of the Maize God impersonator of the East wall – number 6 - who is attacked by 3 Deer, is that the projectile point is stuck in his left eye (pic 2). Such an element might have several interpretations, but they all refer to the morning star and to the maize plant. It could be thought, for instance, that in this scene warrior 3 Deer is a Sun impersonator. According to the “Leyenda de los Soles” it was the Sun who discharged his red quill feather darts against Venus - Tlaawiskalpanteekwtli - “and immediately covered his face”. Another possibility has to do with the patron gods of the Morning Star, who are tearing out the eyes of their victims with a sharp bone. For Seler (1963), it is an allegory for self sacrifice and bloodletting to ensure the resurrection cycle of Nature. More than simple enemies, captives and sacrificed in a battle, I am convinced that the naked characters wearing feathers and bird helmets are victims of a ritual sacrifice in association with the appearances of Venus and auguries concerning the maize cycle of life and death. In a way it is reminiscent of the gladiatorial sacrifice held by the Mexica. Now that I have drawn attention to all the different aspects of the maize god, how I believe they are represented in the mural of the Battle, and the way Venus is related to the whole scene, I can proceed with my interpretation. To me, the murals of Cacaxtla seem to be mainly about the life cycle of maize, the basic item of daily sustenance of Pre-Columbian civilisations. Its uninterrupted course ranging from birth to death, followed by rebirth was in itself the supreme symbol of life, and it was equivalent to other natural basic cycles, such as the year (with its wet and dry seasons), the lunar phases, the periods of Venus, and the infinite sequence of days and nights. Other cultural components, such as hunting, war, sacrifice, self-sacrifice and probably the institution of rulership are intertwined in this visual narrative. The calendar date 3-Deer plays an important role: besides being the name of a day, it also works as the name of a person or god and as symbol of hunting, linked to the relationship between maize, the untamed or wild, and the rapaciousness of the imagery. Erik Velásquez García has made a major study of this subject. The detailed exploration of the connections between these scenes and the Venus cycle carried out by Velásquez contributed very important information that has allowed for a new interpretation of their overall meaning. Helmke and Nielsen have explained that all the vanquishers bear different name glyphs, which lead them to interpret the scene of the Battle mural as indeed depicting a historical event. As an alternative I think that it was not a battle, but rather a theatrical or dramatized representation of a ritual sacrifice uniting two different canonical events fused together in a scene: capture and sacrifice, where the victims are Venus and maize. 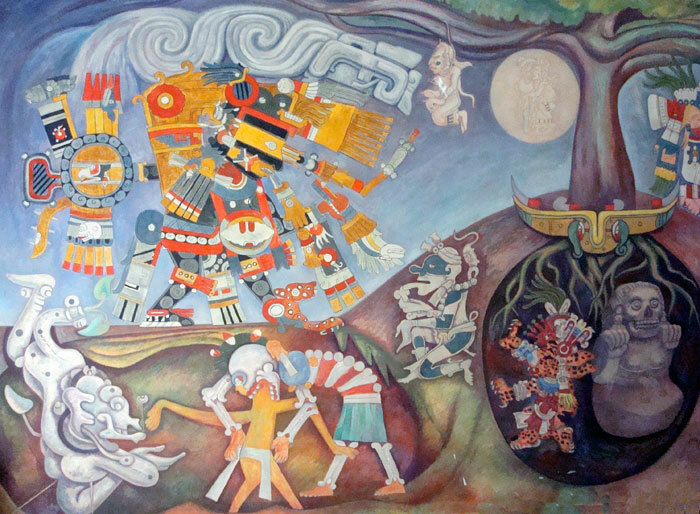 Ceremonial representations in which cosmogony myths and the deeds of the ancestors were reproduced in dramatized ritual dances occurred in many parts of Mesoamerica, and this practice continued until the Colonial period. 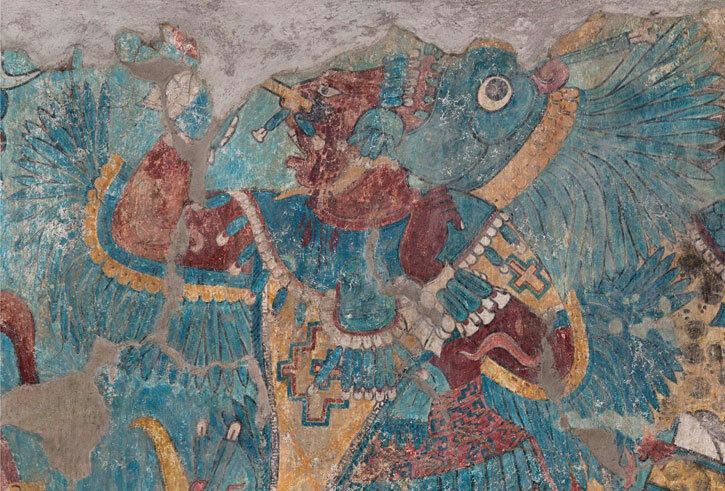 We can find representations of masked characters performing public ritual dances in the murals of Bonampak, the platform of Temple XIX at Palenque, and in some Mayan beakers. 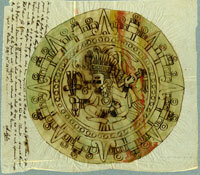 In these dramatizations, an intangible entity, whether a god, ancestor, or other supernatural being would turn visible by means of the bodies of their ritual representatives, who usually were in a state of altered consciousness that conferred them divinatory powers (Velásquez, 2010, 225-226). In Cacaxtla, the ceremonial attire worn by the characters in fact represents the personification of supernatural beings; in other words, the characters take the place of the actual god that their attire represents. 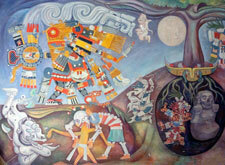 Just as in the Greek Dionysiac festivities, in which agon, the confrontation that happens when nature dies and is renewed, was the focal point of the dramatic performances, the mural of the Battle in Cacaxtla could have depicted a ritual representation in which the main focus was the death and rebirth of the Maize god (pic 3). According to Eliade (2007, 14), the ritual repetition of creation and other primal events was performed with the aim of regenerating the world and human society, because it was believed that through these rituals the gods and their creative energies would become manifest. It was a way of reactivating the sacred forces of creation. By means of the sacrifice of the Maize god, as well as the death of Venus, of the Sun and of the Moon, with their continuous journey through the Underworld, and their rebirth each day or season, the world and human life were regenerated. In Cacaxtla, as in other parts of Mesoamerica, the ritual representation of this continuous cycle of death and renewal played a vital role in the maintenance of universal balance. - Nacimiento y renacimiento: el significado de la iniciación en la cultura humana, Miguel Portillo (tr. ), Barcelona, Kairós, 2007, 2nd. ed. Graves, Robert, Los dos nacimientos de Dionisio, Barcelona, Seix Barral, Biblioteca Breve, (1980) 1984, 3rd. ed. Otto, Walter F., Dionisio: Mito y Culto, Cristina García Ohlrich (tr. ), Madrid, Ediciones Siruela, 2006 (1997), 3rd. ed. Velásquez, Eric, “Naturaleza y papel de las personificaciones en los rituals mayas según las fuentes epigraficas, etnohistóricas y lexicográficas”, in Andrés Ciudad, Ma. Josefa Iglesias y Miguel Sorroche (eds. ), El Ritual en el mundo maya: de lo privado a lo publico, Madrid, Sociedad Española de Estudios Mayas, 2010, pp. 203-233. • Pic 3 (part 1): photo by Citlaltec ((Wikimedia Commons).